These days it seems like much of our time is spent interacting with others via technology. We stay current on the lives of friends and family via Facebook, email, Twitter, texting, Skype and can rarely squeeze in the time to meet in a real-time, physical space. There’s no doubt we’ve gained with the onset of such ready communication, but perhaps we also lose something when we remain tethered to our gadgets. Of course this is by no means a novel thought, but it is worth considering especially when we meet a woman like Holly who, along with her family, has made choices to maintain human connectedness in a wireless world. 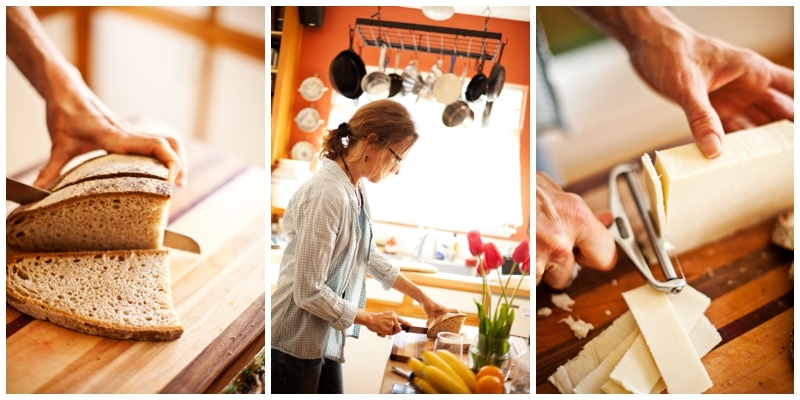 Navigating everyday demands has become exceedingly complicated for most folks, but Holly and her family have hunkered down maintaining their simplistic lifestyle, at least when it comes to food and community. Since the late nineties, they have lived in a co-housing neighborhood where they’ve built deep friendships. All the homes face a community center at which regular communal meals are shared; kids romp around, leaving bikes wherever they land as some new adventure whisks them into bushes or someone’s yard. While the community offers an idyllic child-rearing image, even Holly struggles to round up her own family on a Saturday afternoon. Whether it’s making it to French lessons, soccer practice or delivering Girl Scout cookies, Holly knows her community will help her balance the myriad of family obligations. Once she’s settled in her home after a long day, her support system expands instead of detracts. In fact, it’s not odd to find one neighbor or another striding into her kitchen with a dish, setting off an impromptu dinner that might entice other neighbors. Most of us would drop a plate at the sight of our homes filling up with uninvited guests; perhaps we’d even fake food poisoning just to get out of such an unplanned event, but in Holly’s community it’s understood that an impromptu dinner means great vibes, excellent veggie meals and guaranteed help with the dishes. These gatherings are common, and they are welcome. All we have to do is take a gander around her kitchen to see Holly enjoys a lively, people-filled life; bright rust splashes her walls, pots appear well-used, a griddle rests on the stove and Bob Marley plays in the background. Lucky for us, if we did drop in at Holly’s, there’s a good chance we’d find a counter lined with tomatoes, bread, cheese, cloves, celery and onion: the makings of her famous creamy tomato soup and grilled cheese sandwiches. It’s a simple meal, but each time she serves it her guests ask for the recipe. Her son requests it every year for his birthday even though he’s got the choice of any meal—including eating out. Thick slices of whole wheat crusty bread lathered with butter on one side hit the pan with a sizzle while the soup bubbles on the stove. Holly’s flexible with her bread and cheese choices, but don’t challenge her on how to prepare the bread; she insists the butter must be spread on the bread before it hits the pan in order to get the right buttery balance. She got this recipe from a book and has tweaked it over the years to make it her own; sometimes she even makes a vegan version, but her kids aren’t too fond of the missing dairy. That said, she and her husband go to great lengths to keep their family diet as simple and healthy as possible. They seek local, organic, seasonal food and stay away from meat altogether. In a contemporary moment filled with nutrient-poor fast food and hand-held links to loved ones, Holly and her family choose to eat simple foods and share them with neighbors who’ve become surrogate family. In many homes, we might find blaring televisions or clicking keyboards during dinner. Paradoxically, at Holly’s, many nights are filled with the clink of glasses punctuated by conversation and laughter. Heat the olive oil in a soup pot or dutch oven over medium heat. Add the onion, basil and curry or cloves and cook, stirring a little, for about 5 minutes. Sprinkle the flour over the onions and stir to combine, then add the tomatoes, baking soda and stock. Stir to blend and bring to a gentle boil. Lower the heat and simmer, partially covered, for about 20 minutes. Allow to cool briefly and then either puree in a blender until smooth or use your immersion blender if you have one. Return to the soup pot, add the milk and season with salt & pepper. If it’s too thick, add a little more milk or stock. If it’s too thin or if the flavor isn’t as rich as you like, add a tablespoon of tomato paste. Reheat over a low flame (don’t boil!) and serve hot with freshly ground pepper and a pinch of grated parmesan cheese, if you like.